No more calculating time cards by hand. Our web and mobile time clock app totals employee hours for you so you don’t have to worry about mistakes. Employee time tracking with GPS location fencing, can allow staff to clock in and out of scheduled shifts from any internet enabled device with a single click. Instant alerts notify employees and managers if an employee forgets to clock in or out for work, so you can say goodbye to staff tardiness and late clocks. Get the Details. Download the Features Guide. Our employee time clock software has all of the features necessary to help managers track employee time and attendance - automatically. Managers can see who’s working where, when and on what. They’ll also receive automatic alerts in the event of a conflict or unplanned overtime. Our web-based time clocks keeps track of employee time and attendance for you with the help of automatic alerts. Managers receive notifications when employees fail to clock in or forget to clock out. 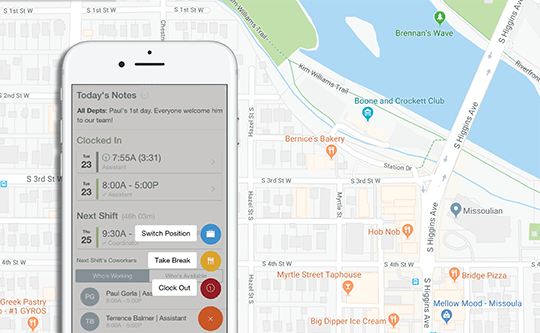 See exactly which employees are working in which locations for any given shift. With our easy to use time clock software, every employee must clock in and out for themselves. No more shadow or buddy clocking between friends. Keep employees from milking the clock by setting a limit on how early they can clock in before a shift starts, and how late they can stay clocked in after a shift ends. Sending accurate timesheets to payroll is easier than ever with our time tracking software. Our system will detect any conflicts or issues before they can make their way to payroll. Managers can leave important messages for staff through our daily notes panel. No more confusion over what’s expected of employees on a day to day basis. No more waiting around to clock in/out of your shift. Our mobile time clock app is designed to be fast and flexible. Employees can clock in and out from any internet device - desktop, tablet or cell phone. 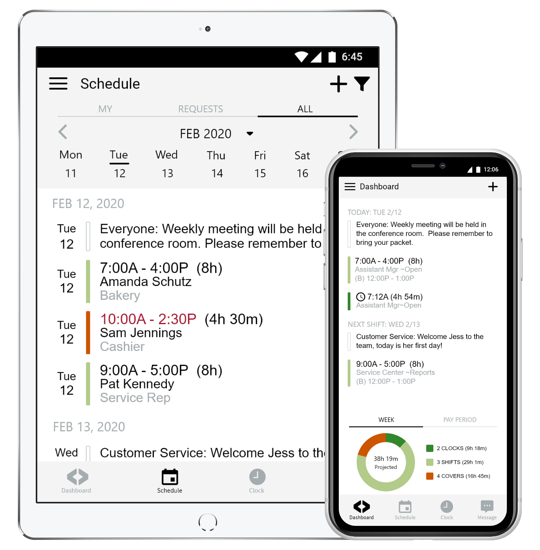 The system automatically compares planned with actual employee activity, and sends alerts to help keep everyone on track. Clocking in and out of your scheduled shift is faster and easier than ever. Get on the clock as soon as you’re on location without having to wait around to punch in. Notes can help employees stay on track with their day-to-day responsibilities. Managers can send targeted messages to different positions, groups or departments to keep everyone up to date and on the same page. After a busy work day, it’s easy to forget to clock out of your shift. 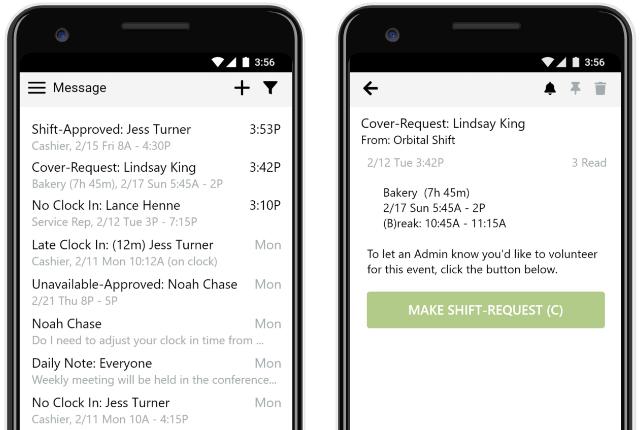 With online time clocks, employees will receive automatic notifications when they forget to clock out, keeping both managers and employees on track and under budget. Don’t want your employees clocking in and out from their phones? No problem. With the easy quick clock station, employees can clock in and out from a specified device with a simple four-digit code. Our online time tracking app combines the power of employee scheduling, cost control management and payroll integration to help you grow your business. No more expensive, clunky time clock hardware taking up space! Move to a web-based mobile time clock that is simple to use and easy to setup. Our web and mobile apps have all the features you need to say goodbye to your time and attendance tracking headaches. Aligning labor time tracking with the complexities of many payroll systems is no simple task. Employers often must respond to the rigorous requirements of flexible compensation methods that make use of special payroll codes, rate types, date-driven holiday pay rates, workman’s compensation codes, and premium pays. No problem, our software is designed to handle these complexities. Stay up to date on employee scheduling trends, missed shifts and vacation time. Spot patterns and take corrective action before conflicts occur. Web-based time clock software makes it easy to export a variety of reports for quick and easy understanding of employee time and attendance information. We have done the work to integrate/export/import with payroll providers and other applications your team may already use to help make common, budgeting, payroll, and personnel processes faster and more accurate. Leverage the rich reporting and data insights capabilities enabled by our integrated scheduling and time clock services. The Time Clock Dashboard automatically tracks who is working, how long they have been clocked-in and the number of hours remaining for their shift. Our staff management software and apps have been designed to meet the rigorous needs for most regulatory compliance reporting needs your company may face – we offer a robust data model and flexible report writing capabilities.